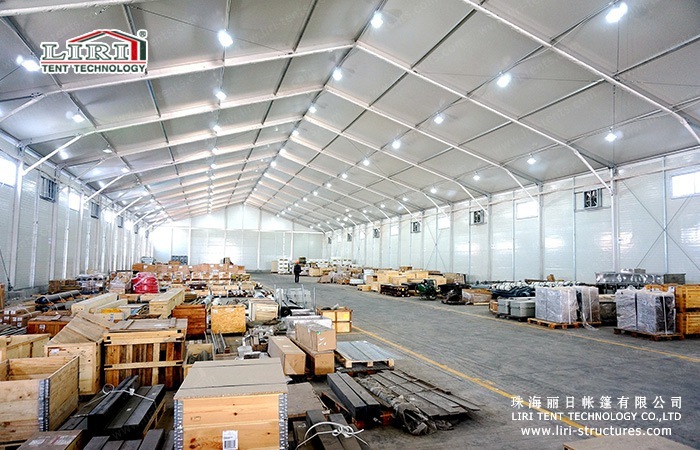 Liri Tent’s Warehouse Tent system is a fast, economical solution for any industrial or warehousing project. 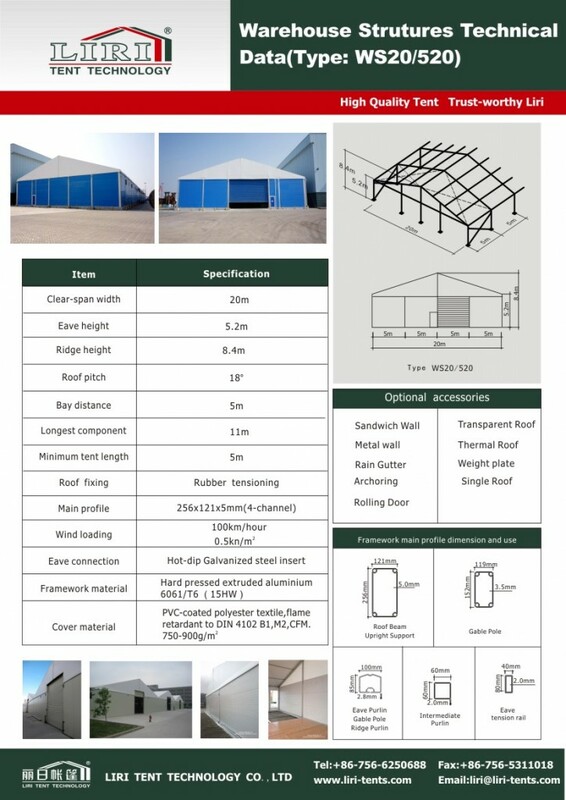 Liri Warehouse Tent offers a unique design that provides enough height and extraordinary clearance for your industrial and warehousing needs. There are no internal pillars for our clear span warehouse tent structures, the forklifts or other heavy machineries can move freely which allows maximum usable space. So warehouse tent structures are a better choice to wood or steel structures. Liri industrial tent structures are built to last more than 10 years, industrial tent structure can be built in almost any ground —- asphalt, concrete, grass and so on. Whether you need a permanent industrial applications building or when the business grows, you need temporary buildings, Zhuhai Liri Tent can provide you the ideal solution. Our warehouse tents for the convenience of construction enterprises short season, the venue provides a flexible distribution of flexible space, avoiding the need to increase the production of space rental, remote working and other hidden costs.Warehouse Tent construction does not require a permanent foundation which can be built in almost any ground —- asphalt, concrete or grass, and so on. Tents in flexibility and economy is far superior to conventional steel structures, construction of buildings and do not have the required land permits trouble.Because of the basic conditions require less, cost is also low, so its maintenance is simple and inexpensive. The most critical, Liri warehouse tents modular architecture design, integrated storage tents provide a good foundation, can according to your needs for industrial applications tailored architecture. Warehouse tent size is from 5m-40m, it is very convenient and customize for the client, it is with a low cost, customize, movable and very convenient. It can also fix with different sidewalls for the different goods. The most popular size will be 20x50m.